Annual reports can be a dreaded part of life for many people in church communications. There are a lot of numbers to digest and it’s a task that has to be done year after year. Harris Creek Baptist Church in McGregor, TX, reimagined what an annual report could be in helping the congregation of 900 see the true work being done. 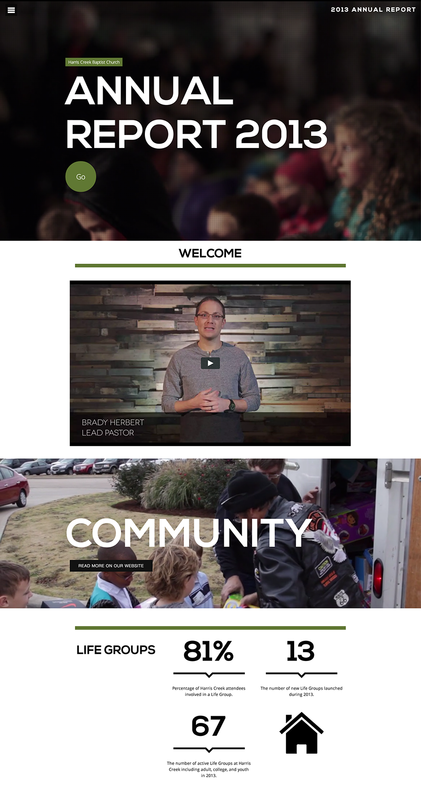 The church launched an on trend, interactive website (annualreport2013.harriscreek.org) with videos, images and easy to read stats that showed the impact the church had over the last year. Gathering the information needed wasn’t easy, but it was crucial to doing this project well. Overall, our judges were impressed with how engaging the site was and how it could also serve as a way to easily show a new person how the church was moving in their community. For Harris Creek, multimedia experiences aren’t just around because they’re trendy. They are a vital way to reach their congregation through a medium they understand. Next, in an effort to improve engagement, Harris Creek plans to improve their video production quality. The church knows it falls in line with a key priority of telling stories of life transformation. Did this church use a format or template for this report? If so, would it be possible to get this. Did it use a software program that is shareable? If so, how can we get either of these things. Great question, Don! Did you get a response? What website/template did Harris Creek use?